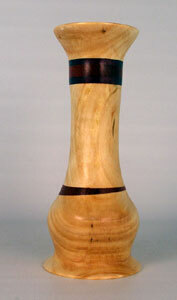 An elegant little vase made from a spruce burl with accents of purple heart and cocobolo woods. The colours re much better in real life than the picture shows. It is 7 1/2″ tall and about 3″ near the base.